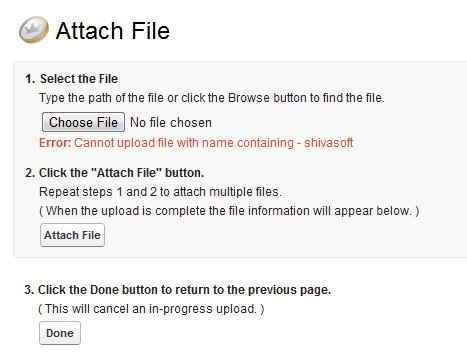 Lots of time i have seen the question on salesforce developer forum regarding the trigger on Attachment. As this is not a straightway, still we can have trigger on Attachment. 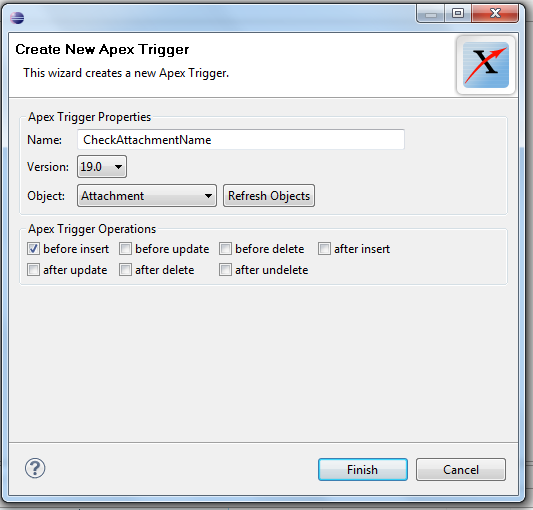 We cannot create trigger on Attachment from the standard salesforce UI however we will have to use the eclipse. While creating the trigger, we have to keep some important points. We should be very careful while writing the trigger on Attachment, as it will be used by any standard or custom Object and therefore the criteria to run trigger for “particular object only” must be handled carefully. In this article i will create the trigger which will check for the parent object “Opportunity”. If the object is opportunity then it will check let say for the file name cannot contain word “shivasoft”. In the above code, we are checking that the Parent id starts with “006” or not. As starting three characters in ID identifies the type of the object. There is one method created named “isOpportunityParent” which uses the SOQL approach but it is not recommended and may cause SOQL limit exception in bulk processing. We can supply the list of Id in method and return the Map which will contain ParentId as Key and Boolean as value identifying that the particular id belongs to opportunity or not? what do u want to say by “Â get time of hour,month of date in trigger”. i am having a doubt on triggers.how to add an relationship field in triggers if some field is equal to some value.for example if i have given type=prospect in account object then i want to display oppurtunities who related to accounts objects. I am trying to create a Trigger on the parent object to see if the attachment is provided by the user or not. If it is, then check box field needs to be TRUE on the Parent object. Did you find the resolution to this? I am trying to do the exact same thing. Hi Jitendra, is it possible to have something on Notes & Attachment to log a event when someone downloaded/viewed the attached? How do you create a trigger that prevents a user from either deleting or editing attachment also is it possible for you to lock down attachment ie Read Only after attaching documents? Thanks and more power ! Hi Jitendra, How to write after insert trigger for adding custom fields on a child object of account by using attachments which will be create multiple records in that object.